With the right hand, pass the yarn underneath and around the right-hand needle.Hold the yarn with your right hand and slide the left-hand needle towards the tip of the right-hand needle.Pull up the working yarn with the tip of the right-hand needle so that the right-hand needle is on top of the left-hand needle. 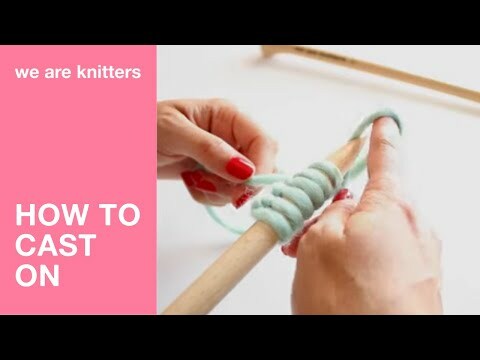 Slide the right-hand needle along the left-hand needle until the stitch is dropped from the left-hand needle.You have now made your first knit stitch.Insert the needle into the next stitch, wrap the yarn, slide, pull the yarn through the stitch on the left-hand needle and drop the stitch. Insert the needle into the next stitch, wrap the yarn, slide, pull the yarn through the stitch on the left-hand needle and drop the stitch.Repeat until you’ve knitted all of the stitches on the needle.When you finish the row, place the needle with the stitches in your other hand and begin again.